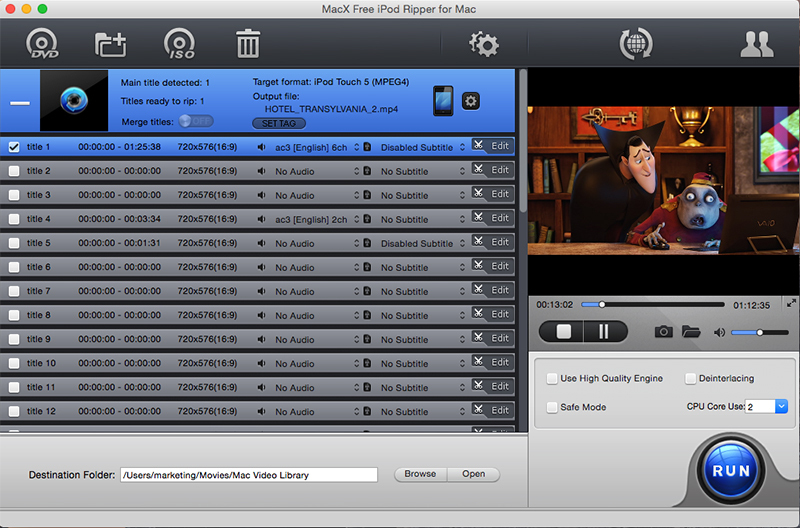 MacX Free iPod Ripper for Mac is a surprisingly full-featured yet completely free Mac DVD to iPod ripper which works perfectly to free convert any DVD to iPod, iTunes, MP3 files on Mac OS with high speed and top quality. This free iPod ripper allows you to remove various DVD copy protections like Sony ARccOS, region protection, CSS encryption as well as trim or split a DVD title or chapter before ripping or capture DVD images amongst many others. Thanks to the easy-to-use interface, this Mac free iPod DVD ripper allows both novices and seasoned users to finish the task with minimum effort. Main Features: 1. Rip DVD to iPod supported video format and convert DVD to iTunes compatible video for playback on iPhone/iPad/Apple TV with ideal effects. 2. Remove various DVD copy protections like Sony ARccOS, region protection, CSS encryption, etc. 3. Besides ripping DVD to iPod, this DVD ripper can also be used to rip DVD to MP4, or convert DVD to MOV video. 4. Fast converting speed and superb output video quality are guaranteed with the assistance of "Advanced De-interlace Accelerator", "Intelligent A/V Synchronizer" and "Run as Safe Mode" functions. 5. Excellent Video editing features: extract desired segment from DVD, cut off unwanted clips, add external subtitle to the video, tweak video parameters, etc. 6. Take screenshots from DVD scene to save them as JPG or BMP and extract audio out of DVD and save as MP3 Music file. 1. More audio and video output formats. 2. New video editing feature. 3. Brand new Mac-style user interface. 4. 20%-30% faster DVD to iPod ripping speed. Top 4 Download periodically updates software information of MacX Free iPod Ripper for Mac 4.2.0 full version from the publisher, but some information may be slightly out-of-date. Using warez version, crack, warez passwords, patches, serial numbers, registration codes, key generator, pirate key, keymaker or keygen for MacX Free iPod Ripper for Mac 4.2.0 license key is illegal and prevent future development of MacX Free iPod Ripper for Mac 4.2.0. Download links are directly from our mirrors or publisher's website, MacX Free iPod Ripper for Mac 4.2.0 torrent files or shared files from free file sharing and free upload services, including Rapidshare, HellShare, HotFile, FileServe, MegaUpload, YouSendIt, SendSpace, DepositFiles, Letitbit, MailBigFile, DropSend, MediaMax, LeapFile, zUpload, MyOtherDrive, DivShare or MediaFire, are not allowed! Your computer will be at risk getting infected with spyware, adware, viruses, worms, trojan horses, dialers, etc while you are searching and browsing these illegal sites which distribute a so called keygen, key generator, pirate key, serial number, warez full version or crack for MacX Free iPod Ripper for Mac 4.2.0 download. These infections might corrupt your computer installation or breach your privacy. A keygen or key generator might contain a trojan horse opening a backdoor on your computer. Hackers can use this backdoor to take control of your computer, copy data from your computer or to use your computer to distribute viruses and spam to other people.